Sending party guests home with a beautiful and useful party favor is a great way for them to remember the special occasion! 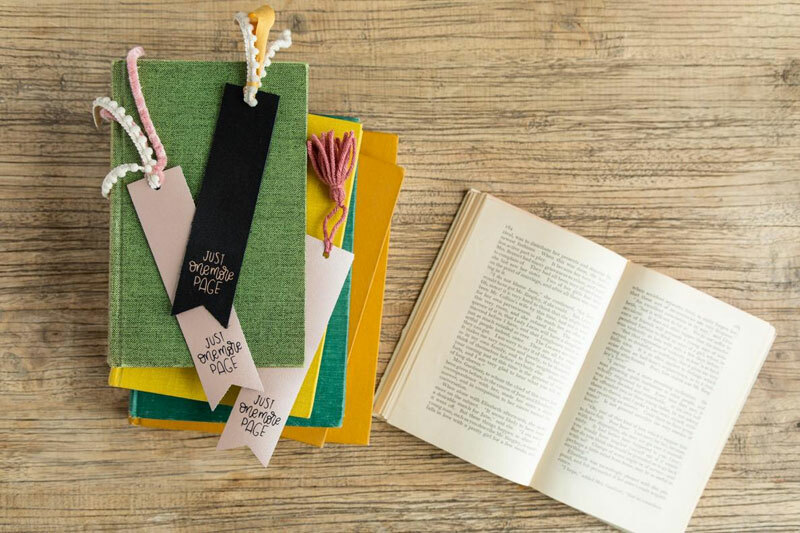 A simple leather bookmark is cut with Cricut Maker® and embellished with iron-on vinyl and colorful ribbon and tassels. Kids aren’t the only ones asking for one more story at bedtime, so why not let book-loving adults sneak in one more page too? We wanted to create a party favor for the baby shower that wouldn’t be tossed aside and forgotten when guests return home. 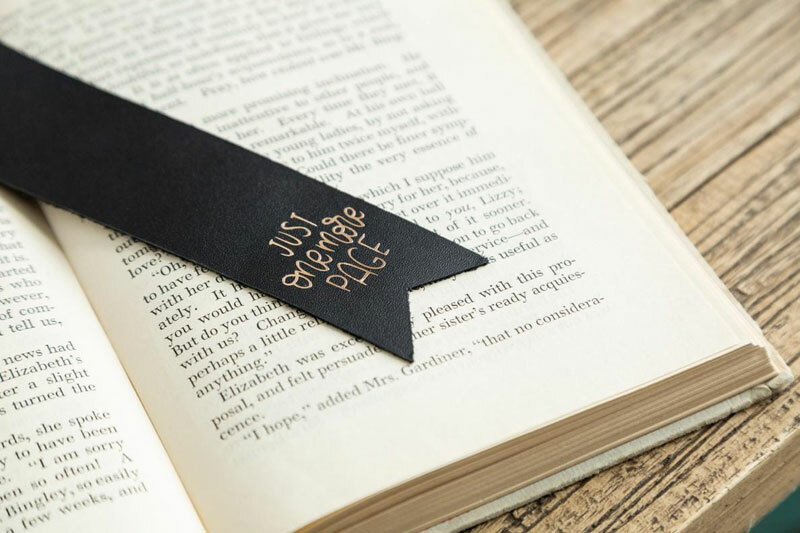 We love the simple elegance of these leather bookmarks as favors or gifts for the reader in your life! The file is sized for the finished project to be 1.5 inches by 6.5 inches. The size can be adjusted in Design Space, though we don’t recommend making it any smaller if you are going to use the coordinating “Just One More Page” design because it may be too small. When cutting any thick materials such as chipboard, balsa wood, or leather be sure to use the StrongGrip Mat. Place a full sheet or desired size piece of leather on to the mat and make sure it is correctly aligned and smooth. Once your bookmark shapes have been cut, carefully remove them from the mat, along with excess material. The Cricut scraper tool is helpful in removing any remaining fibers left behind on the mat. Prepare your iron-on by adhering it to a StandardGrip mat, shiny side down. Make sure to mirror your image, then follow the prompts in Design Space to cut your design. Next, use a weeder tool to remove the excess vinyl from the clear plastic carrier sheet, leaving just your design. Here’s our favorite part! Cutting the leather is fun but adding the iron-on makes the bookmark so unique and beautiful. We can’t wait to use this technique on other leather projects. 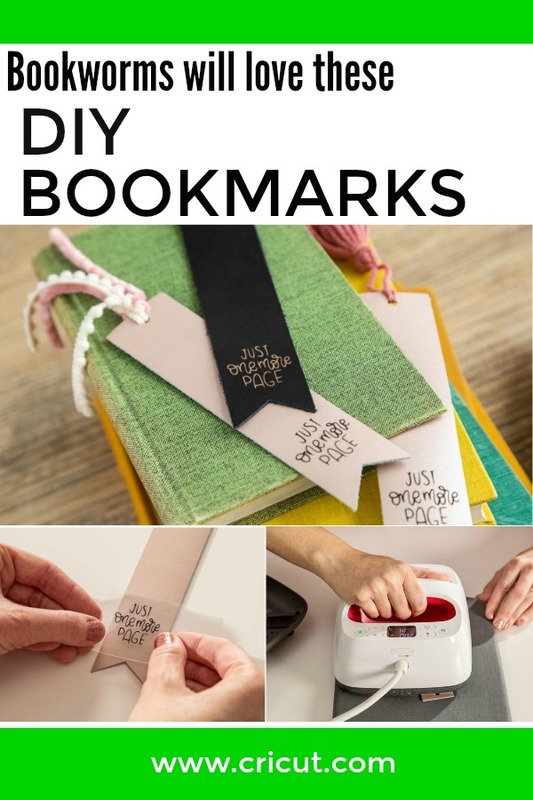 Place the iron-on design on the bookmark and get out that EasyPress! When it’s time to use the EasyPress, we always open Cricut’s Interactive Quick Reference Guide to find the exact temperature and settings to use. Select the iron-on type and base material and follow the directions including heat, pressure, and length of time. 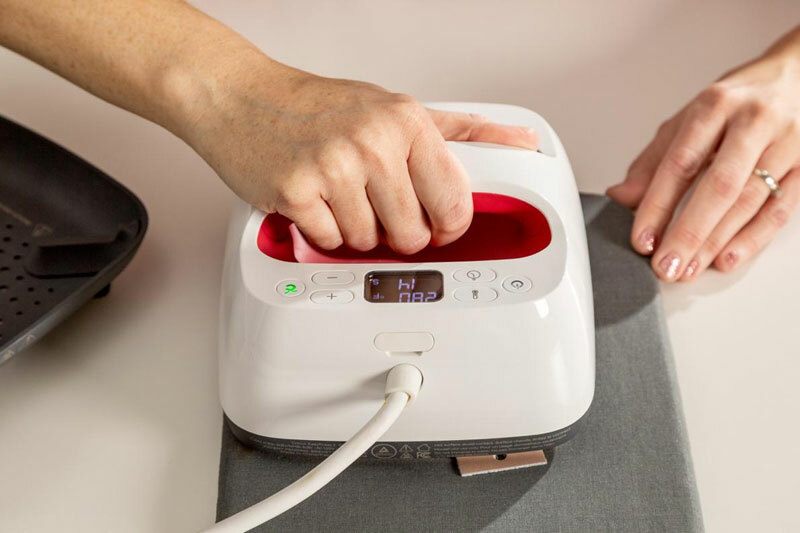 Tip: When using any type of iron-on, pay special attention to instructions regarding using a “warm peel” or “cold peel”. For this project, we removed the clear liner while it was still warm (just after using the EasyPress) but some materials require you to wait until the material has completely cooled. Always double check! 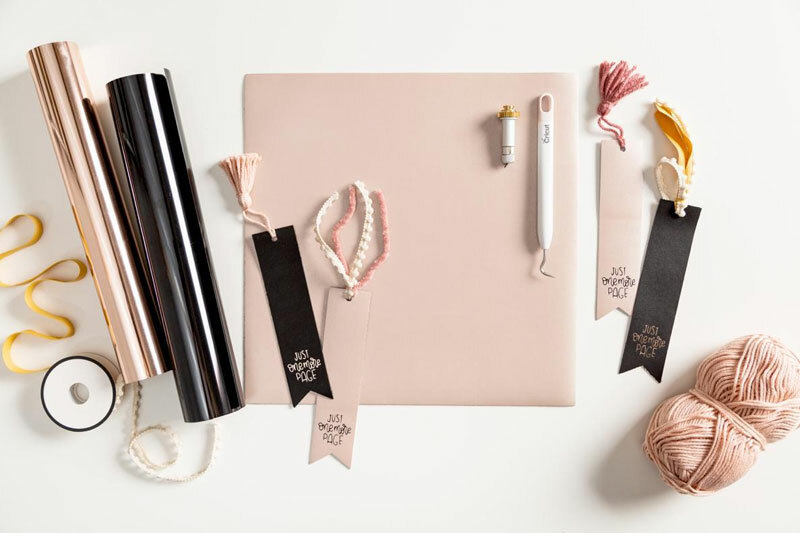 Finally, it’s time to add some fun and flair to the ends of these gorgeous party favors. 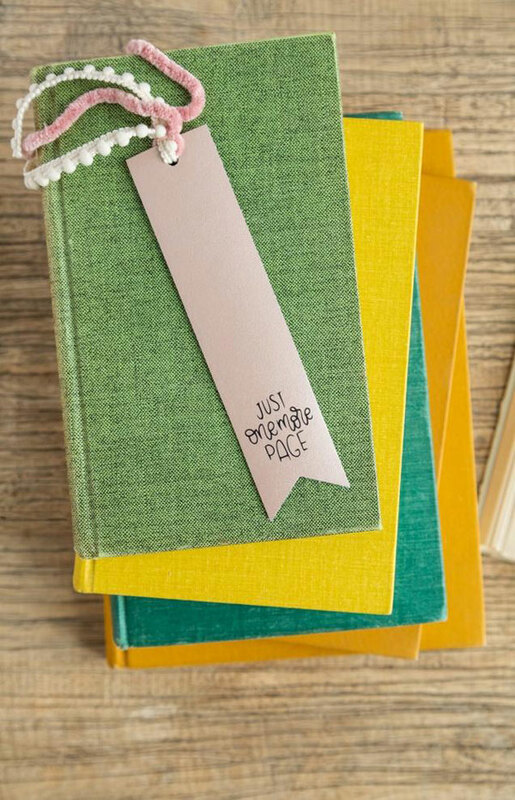 You can use ribbon, pom poms, or any decorative trim to finish off the bookmarks. A simple yarn tassel in one or multiple colors is so simple to make yourself. We also love the look of mixing a few colors and textures together like the example below. These bookmarks were such a fun project to make. The possibilities are endless - think of the gifts you could make using this technique! We can’t wait to cut more things with leather and we love having a machine that does it so beautifully. 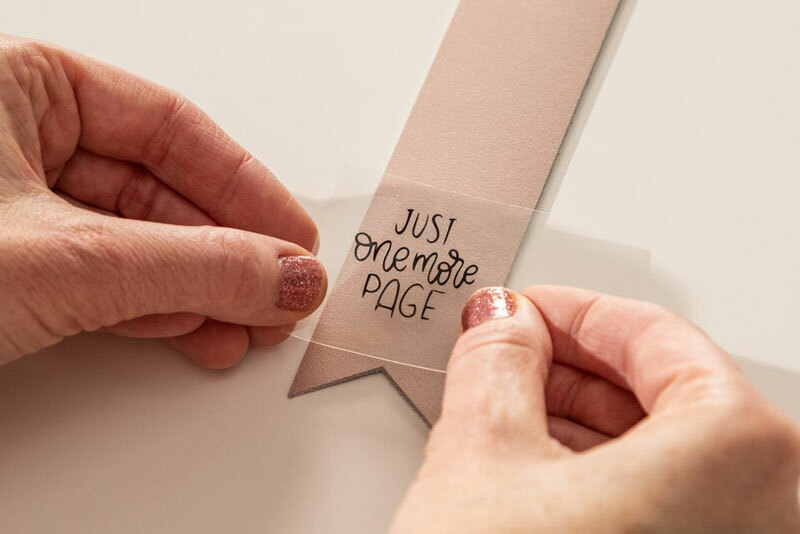 DIY Bookmark International Literacy Day, Literally!